Mango has launched its Evening campaign for the holiday season, featuring party-themed pieces designed to make you feel glamorous and stand out. 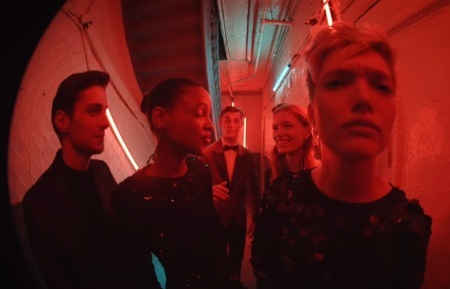 The campaign film, titled “Before Midnight”, features models Aya Jones, Ruth Bell, Julia Hafstrom, Matthew Bell, Kit Butler and Alexis Petit hurrying through the buzzing Chinatown lights to get to a party, as it is implied by both their outfits and the club they’re going to, that seems like an apartment at the first floor of a building. Among the showcased items from the women collection there are a ribbed knit sweater ($59.99), a knot metallic skirt ($59.99), a sequin black sweater ($79.99), trim wool-blend black trousers ($119,99), a pursed sequined dress ($79,99), an embroidered lace t-shirt ($39.99), a dark green satin gown ($149.99), a petrol blue wrap neckline velvet dress ($249.99), and accessories including mixed asymmetric earrings ($25.99), metal pendant earrings($25.99), plumeti tights ($19.99), and a velvet coffer bag ($49.99). One of the male models is sporting a slim-fit tailored stretch cotton shirt ($69.99) and a slim-fit velvet suit blazer ($99.99), accessorized with a satin bow tie ($35.99), another one is sporting a sark navy slim-fit satin blazer ($99.99) over a black essential cotton-blend sweater ($29.99 – that is available also in other hues), and another one is sporting a grey slim fit flecked blazer ($139.99), and black satin trims chinos ($69.99). album, “Parallel Lines”, released in 1978.